Sometimes what's obvious can whisk right past us without our knowledge. Your a sales person selling a certain product set to customers in the B2B world. The first thing we all need to do as salespeople is build a call list and begin prospecting. If you're calling into businesses that are medium-size or larger, you are probably trying to determine the best entry point into your accounts. Likely, your natural assumption, often backed by common practice among your colleagues, is to call "the person who is in charge of X." Here's a tip that has helped many sales people find new entry points into their accounts. 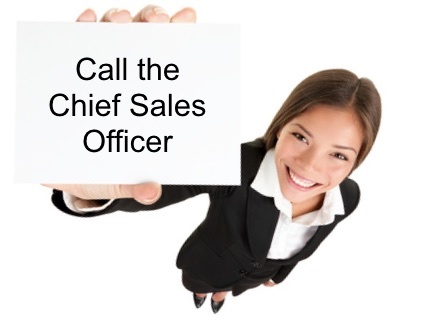 Try calling the Chief Sales Officer (CSO). "Huh? They aren't in charge of what I sell." No, he or she probably isn't in charge what you sell, but they are in charge of what you do for their company. Follow this logic for a moment. Who in your customer organization can better identify with your plight as a salesperson trying to get in door with their company better than the CSO? Who can provide more help in guiding you on how to sell to the organization, once your build the relationship, than the CSO? The answer is no one. If you present yourself as a salesperson trying to drive business results and just looking for an honest chance to get your foot in the door, the CSO is the odds-on favorite within that organization to "get that." Now, you still need to approach the CSO, as you do any top executive, speaking their language and helping to solve their problems. Think about how your product or service can drive sales for them. How can you help other organizations do a better job for sales? Think about (or better research) what his or her top challenge are. It's a little unorthodox and many sales people never get out of that pigeon-hole of calling "the person in charge of X." If you can think and act outside that box and "sell" yourself to the CSO, you could build a new, powerful bridge into your customer's organization. Ray Davis is the Founder of The Affirmation Spot and co-founder of 6 Sense Media. He’s been writing, recording, and using affirmations for 30 years. He's also the author of Anunnaki Awakening. Ray has spent 25 years in the B2B selling world, first as a successful salesperson and later writing sales training programs at a Fortune 100 company.